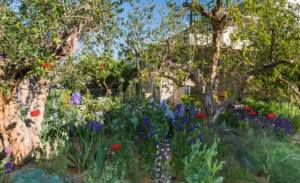 As the Chelsea Flower Show gets underway, Pro Landscaper reveals the ten top trends seen in the award-winning gardens designed by members of the Society of Garden Designers. 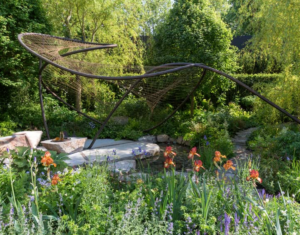 Dramatic sculptural forms are a frequent motif at RHS Chelsea and this year is no exception, with Kate Gould MSGD, Tony Woods MSGD and Jo Thompson MSGD all incorporating striking sculptures into their gardens. Collaborations between garden designers and sculptors in the creation of the gardens themselves are also evident. Stuart Towner’s Spirit of Cornwall garden inspired by the work of Barbara Hepworth, is a collaboration between Towner and sculptor Sheila Vollmer; whilst Nic Howard has collaborated with award-winning artist David Harber to create a garden where planting and sculpture take centre stage together. 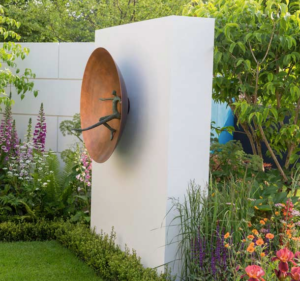 Metalwork is a central feature in many of the gardens at RHS Chelsea this year, creating bold shapes amongst planting and adding instant impact to the designs. 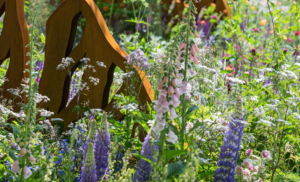 A sequence of metal spines create a connective thread running the length of Stuart Towner’s Spirit of Cornwall Garden, while Tony Wood MSGD incorporates a series of beautiful corten steel structures and grates highlighted by planting in purples and deep reds. The Wedgwood Garden designed by Jo Thompson MSGD also features a stunning bronze pavilion at its centre bringing an ephemeral quality to the garden. Chelsea may be a quintessentially British event, but gardens this year have taken inspiration from all over the world. 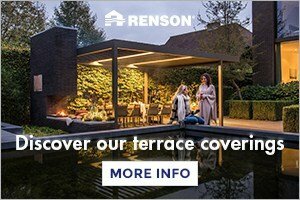 The British Council UK Artisan Garden by Sarah Eberle FSGD is inspired by the Moghul gardens of North India and features traditional Pietra Dura marblework in a stunning surrounding wall. Jo Thompson MSGD uses the ancient Japanese art of Kintsugi to form a meandering path through her floral Wedgwood garden, and Tom Massey’s Lemon Tree Trust garden is filled with Middle Eastern references in both his planting and in a pavilion inspired by traditional Islamic designs. Elsewhere, planting in Patrick Collins Wuhan Water Garden is a celebration of Chinese Flora. Evident in gardens large and small this year is one of the key trends for incorporating edibles into floral displays. Tom Massey uses herbs, cleverly displayed on a planted-up building block wall, and exotic fruit trees – including lemons, a pomegranate and a fig – in his Middle Eastern inspired garden, Kate Savill and Tamara Bridge use plants that feature as flavourings in Warner Edwards Gin including rhubarb and juniper and Tony Woods MSGD features a living wall of edible flowers, herbs, salad and soft fruit. Elsewhere, the Seedlip Garden by Catherine MacDonald celebrates the humble pea, featuring the common garden pea at the centre of her design alongside more unusual varieties. 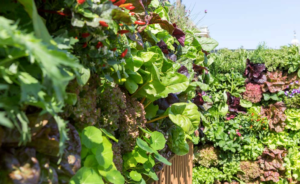 The environment is high on the list at RHS Chelsea this year, with ecology trends a central theme in many of the gardens. Tom Stuart-Smith MSGD has created a feature garden using recycled plants and materials for the Garfield Weston Foundation, while Kate Gould MSGD incorporates cutting edge paving, with integral energy harvesting technology, with plants chosen for their ability to cope with high levels of pollution and Tony Woods MSGD showcases varieties that cope well both with excess rainfall and drought, including Irises, Podophyllum peltatum, and Ophiopogon planiscapus ‘Nigrescens’ or Black Mondo. 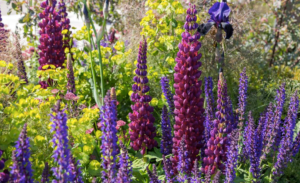 Lupin lovers will be spoilt for choice as the English garden favourite takes centre stage on gardens throughout the show this year, including vibrant yellow and red varieties in Catherine MacDonald’s Seedlip Garden, a beautiful display of purples in the Urban Flow garden by Tony Woods MSGD and softer pinks and pale blues in Nic Howard’s sculptural Show Garden. Elsewhere, Naomi Ferret-Cohen uses them to add a warm, bright touch to her debut garden ‘A Life without Walls’. Feminine, floral and romantic, traditional cottage garden plants are always popular at RHS Chelsea and 2018 sees them return in abundance. Jonathan Snow contrasts hard-leaved Mediterranean foliage with splashes of colour from roses, salvias, and astrantias; Nic Howard mixes wild plants with peonies, irises and geraniums to create a blowsy, colourful display, and Sarah Eberle FSGD creates a barrage of energetic colour with marigolds, roses, tulips and poppies. Seating as an art form features in gardens by Nic Howard and Matt Keightley MSGD as well as in Kate Savill and Tamara Bridge’s garden for Warner Edwards Distillery and on Naomi Ferret-Cohen’s Space to Grow garden. Nic’s sculpture garden includes a sculptural bench referencing the DNA helix and set amongst colourful planting, while Matt incorporates bespoke timber benches and stools, designed by him and inspired by cells, into the margins of sweeping flower beds. 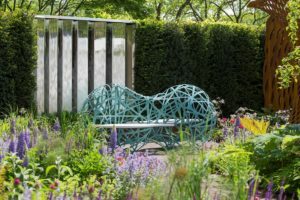 Two copper seats inspired by distillation stills used in the brewing of gin, form a key feature in Kate and Tamara’s Artisan design and Naomi incorporates a beautiful curved bench into an open seating area at the front of her Life without Walls garden. 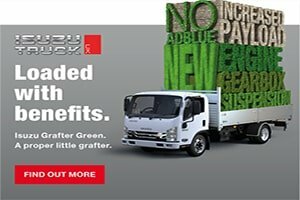 New designs in water features including large-scale installations, form a central element in many of the gardens at RHS Chelsea this year. Patrick Collins has created a ‘lake’ from a series of prefabricated, interconnecting tanks, each of which contains water or water and planting, to create a chessboard effect with a series of spectacular fountains at the centre. 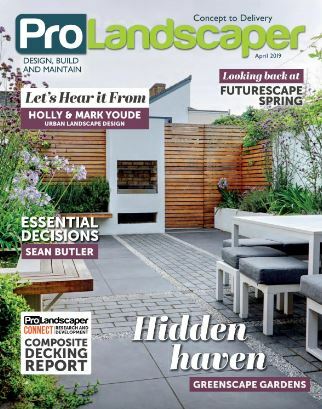 Tony Woods MSGD incorporates beautiful cast iron grates in the floor of his design, allowing rainwater to cascade through into a trough below – filtering the water through to the flower beds for an eco-friendly way to water – sure to be one of the year’s hottest trends. 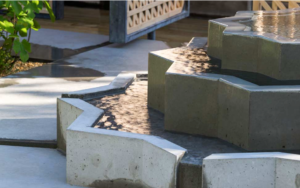 Stuart Towner incorporates a series of continuous circulating water features echoing the sea views from Barbara Hepworth’s Cornish home, and Tom Massey’s garden features a star-shaped fountain with radiating water rills inspired by traditional Islamic designs. Purple, bronze and rust are key trends this year alongside yellows, oranges and deep reds. Jo Thompson MSGD creates a feeling of elegance and sophistication with a palette inspired by the patterns on Wedgwood china. Kate Gould MSGD uses a combination of rich plum and blush with calmer greens to the rear in her New West End Garden and Catherine MacDonald combines beautiful reds, yellows and purples to reflect the pods of some of the more unusual pea plants that have inspired her garden for Seedlip. 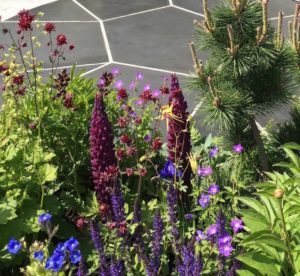 Elsewhere, Tony Woods MSGD uses a spectrum of purples and dark maroons to pick out the depth of colour in the corten steel used throughout his garden and Tom Massey includes deep purple irises against a grey concrete backdrop.